I used to be a jogger for many years. Finally, as often happens to joggers, my knee (the right one) started to hurt. The doctor asked me "if you stop running, does it stop hurting?" Well, on his orders I stopped running... Being used to exercise, I became restless. To help me out of this condition my older son suggested to me I could go biking. What? At my age? And on one of those bikes with the crooked and bent handle bar? Also, what about all those cars on the road? He said, trust me, try it, you'll like it! He bought me a Schwinn (Prelude) road bike. He also took me for a couple of rides with him. It was sheer joy! 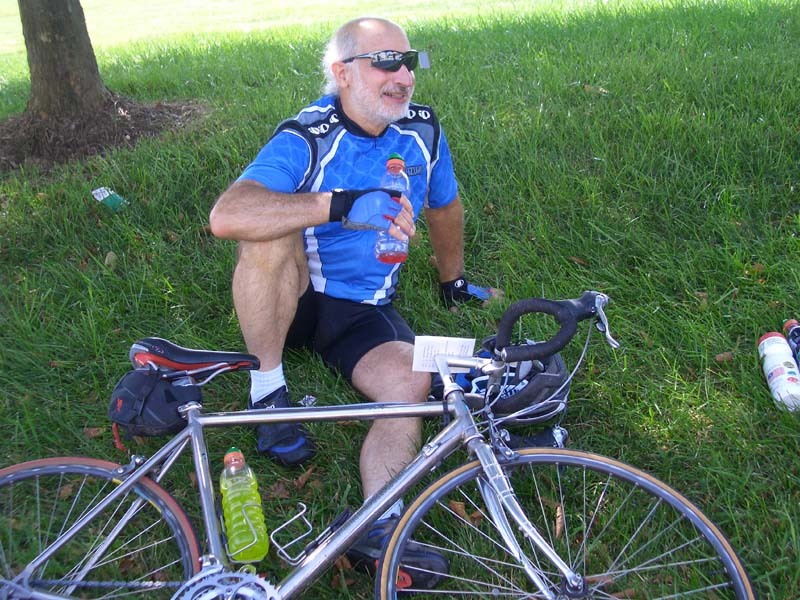 No knee pain, even when I go for a hundred miles in one day (a century ride.) Of course after a century ride, I feel pain and tiredness all over, but that is exhilarating, unlike the knee pain. Now I have a titanium road bike (Performance TR-1000) and a mountain bike (Performance M-505) both with Shimano components. I try to go biking three times a week for a total of 100 miles or more. In the winter I cannot bike on days when there is snow or ice on the ground or the temperature is below 35 deg. F. Most other times I go for a ride. I love to go on Rock Creek Trail. This is a paved trail that goes through Washington, DC, all the way to Mount Vernon, the famous place where our first president George Washington had his estate and plantation. Normally I ride from Lake Needwood (where the trail begins) and go to the DC line, a round trip of 30 miles. 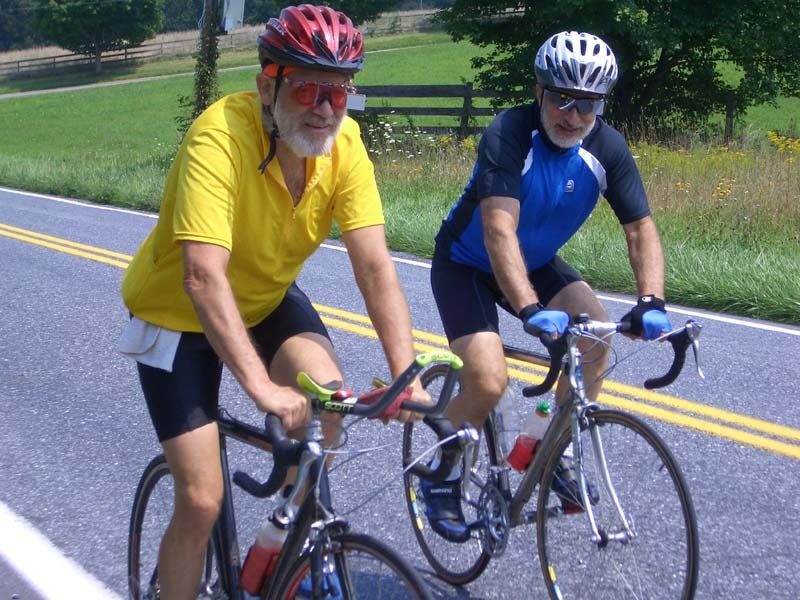 On weekends I go with our biking club, Potomac Pedalers Touring Club or PPTC. I usually lead one ride a month. It is one of the largest biking clubs in the USA. On July 29, 2004, I was biking with my friends Harold and Janet. All the pictures on the left were taken by Janet. Click on any of them to see a bigger picture. I am riding my Performance TR-1000 bike. 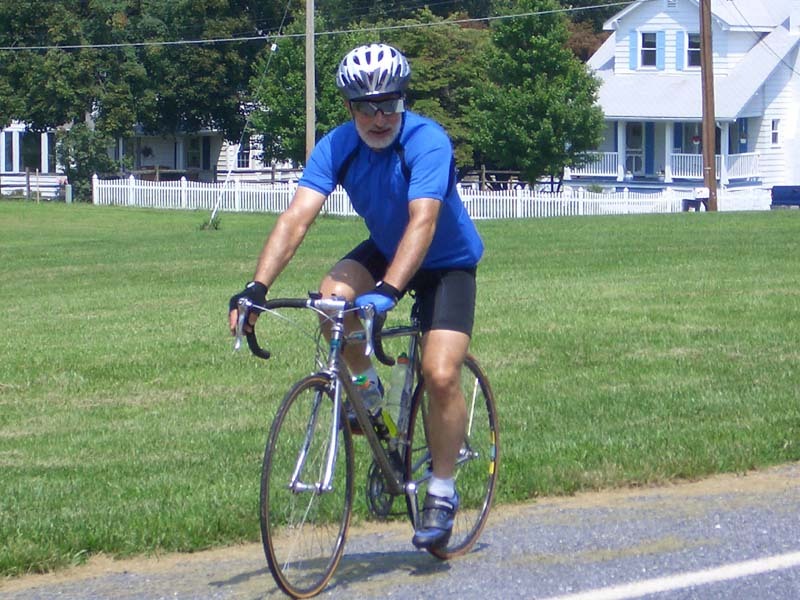 The ride we go on starts near Laytonsville and goes for 32.3 miles with a climb equal to 770 meters (2,525 ft.) Most of the climb occurs on a hilly road called "Long Corner Road." I usually go on this ride twice a week (weather permitting.) On the weekend I go with PPTC for a 40+ mile ride. This gives me over 100 miles of biking per week.